The official version of Joseph Smith’s First Vision states that in the spring of 1820, Joseph Smith saw God and Jesus after overcoming Satan’s attempt to destroy him. Yet, it seems hardly a family member, neighbor, newspaper, clergy, early Mormon convert or detractor was aware of this event until nearly two decades later. Early backlash against Joseph stemmed more from the family’s unpaid debts and treasure digging ventures, not from a visionary encounter. See the chronology for a fuller understanding of events in contexts. In 1839, Orson Pratt created a proselytizing pamphlet in Scotland, which became the first ever published account of the First Vision, though it was not circulated in the U.S. The story of the First Vision was presented to U.S. members in the Times and Seasons in March 1842. Of the numerous church-sponsored publications, as well as publications critical of the Mormons, none mentioned the First Vision. Joseph’s mother, Lucy, dated the Palmyra revivals after Alvin’s death in 1823—during the time she began seeking comfort in the religious community. The revival periods are an important question, as Smith’s 1838-39 account states that “great multitudes” joined the various churches. Reverend Wesley P. Walters concurred, pointing to contemporary records that state 1824 as the date of the revival Joseph Smith referred to, not 1820. 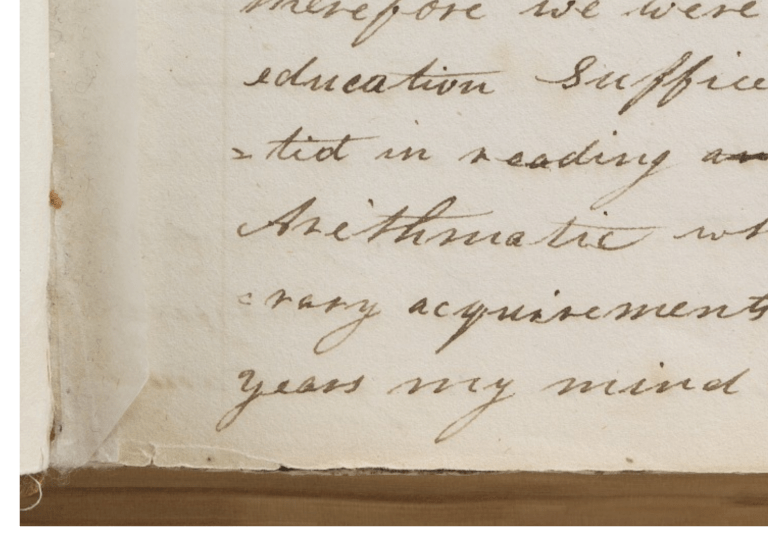 Oliver Cowdery, likewise, places the revival in 1823 and, according to Walters, “makes no reference to any vision occurring in 1820.”  Lucy kept a personal journal. Though she frequently elaborated on mundane things, such as being offended when a gathering of local ladies criticized her modest log cabin, she recorded no mention of her son’s visitation with God. Judged by modern standards, visions may seem extraordinary, but they were more common during the Second Great Awakening of the early 1800s. Believers of all denominational stripes experienced visions during this revivalist period. Mysticism, speaking in tongues, falling down, shaking, and visions were common occurrences at large revivals such as the Cain Ridge Revival of 1801. Even Joseph Smith Sr. reported at least seven significant visions, five of which Lucy Smith summarized in her memoirs. The Burned-over District  refers to the western and central regions of New York in the early nineteenth century, where revivals and the formation of new religious movements took place. Numerous religious movements sprang up in America during what historians now call the Second Great Awakening, many claiming visions of divine beings. A number of these new religious groups, now called “restorationists,” believed that their churches were the restored church of Jesus Christ. The accounts of 16 similar visionaries predating Smith’s illustrate a common theme in language and circumstance, even referring to the woods, a dark grove, descriptions of divine beings as being physically embodied and “above the brightness of the sun,” forgiven sins, and the corruption of all churches. Over time, there came to be 4 primary first-hand vision versions, each providing conflicting details, each increasingly complex and impressive. There are also eight to ten second-hand versions of lesser importance. But even in the accounts credited to Joseph, details such as his age, who appeared, and even his stated motivations for seeking the Lord are inconsistent. Joseph’s earliest attempt to record his history in 1832 contains a brief, firsthand account of his vision experience, perhaps dictated to or amended by Frederick G. Williams, which mentions seeing “the Lord . . . in the sixteenth year of my age.” The revelation continues that “the Lord” opened the heavens, and then again that Joseph Smith saw the “Lord.” Some scholars of Mormonism nuance these two mentions of “the Lord” as indication of two divine beings, attempting to accord the 1832 account with later accounts; however, evidence suggests that Joseph Smith held trinitarian views at the time of this writing. A more reasonable explanation is that Joseph Smith used common evangelical beliefs in his description of the Lord. No mention of God or Satan, only The Lord. No mention of other churches being corrupt. “16th year of my age” would make Joseph fifteen or sixteen at the time. Two personages are mentioned, one followed by another, contradicting the 1838 version. Smith’s age is reported to be “about 14” at the time of the vision. Joseph’s journal indicates that he, Sidney Rigdon, and George Robinson collaborated on beginning his history in late April. We do not know who actually wrote this narrative, as it is unlike anything Joseph ever wrote himself. It increasingly incorporates King James Bible material. “They draw near to me to with their lips but their hearts are far from me” is a loose quote from Isaiah 29:13. “They teach for doctrines the commandments of men” is a quote from Matthew 15:9. The wording “having a form of Godliness but they deny the power thereof” is a quote from 2 Timothy 3:5. Smith’s age is reported to be 15 at the time of the vision. Joseph’s letter to John Wentworth was published in Times and Seasons on March 1, 1842. This is the first published account of the first vision in the U.S. It is also the first time the Church officially stated that Native Americans are the primary descendants of the Lamanites. Brigham Young abruptly led the Saints out of Nauvoo through Iowa with boxes of records in tow. Letterbook 1, containing Joseph’s earliest first vision account (the 1832 account), was in one of the boxes. In 1921, Joseph Fielding Smith was called as Church Historian and discovered Letterbook 1 sometime between 1921–1935. Joseph Fielding Smith removed three pages from Letterbook 1 that contained Joseph Smith’s 1832 account of his vision. By this point, a restricted section already existed in the Church’s archives, prohibiting anyone from entering without special permission. However, Joseph Fielding Smith kept the pages within his private safe, the contents of which eventually became part of the First Presidency Vault. We can only speculate as to why Joseph Fielding Smith excised and shielded the 1832 account from view. Some speculate that it owed to the sacred nature of the document—an account of the First Vision in Smith’s own writing. Others suggest that Joseph Fielding Smith deliberately buried the document due to its contradictory details with the official account. In 1950, Levi Young, president of First Quorum of Seventies, requested access to the journal, which Joseph Fielding Smith denied. Levi went over his head and obtained clearance, gaining access to the private safe only after promising not to tell anyone or copy anything. In 1952, Lamar Peterson, an amateur historian, interviewed Levi Young when he mentioned a “strange account of the first vision,” but said it needed to remain confidential. Peterson maintained confidentiality until Levi’s death in 1963, at which time Lamar informed Gerald and Sandra Tanner who began writing about the enigmatic document. As public pressure escalated, Joseph Fielding Smith taped the pages back into the journal and reluctantly made the archive available to BYU student Paul Cheesman, who included it in his 1965 master’s thesis. FairMormon: Did Joseph Fielding Smith remove the 1832 account? Church leaders and members rarely discussed the First Vision in the nineteenth-century church. Statements from prophets, apostles, and various leaders demonstrate their belief that God did not come down, or that Joseph saw an angel. Particularly telling is that none of the anti-Mormon publications of the day even mentioned the First Vision, let alone criticized it, reinforcing the fact that no one heard of it until decades later. 1829 – The Smith family wrote many letters to family members promoting the Book of Mormon, yet none mentioned a first vision or visitation from God. 1832 – Delusions, Analysis of Book of Mormon, by Alexander Campbell, did not mention or criticize Smith’s vision. 1834 – Mormonism Unvailed, a comprehensive anti-Mormon manifesto containing numerous sworn affidavits from Smith’s neighbors and associates, contained no mention of any vision. 1835 – Joseph Smith worked directly with Oliver Cowdery to produce an account of early church beginnings for publication in the Messenger and Advocate paper, yet it too contained no mention of any vision. 1835 – The earliest version of the D&C contains the Lectures of Faith, which described God as a spirit only, and no mention of Joseph having seen either God or Jesus. 1837 – Parley P. Pratt published A Voice of Warning, a 200 page missionary pamphlet to promote the restoration and communicate the most important aspects Mormonism, yet it failed to mention a vision. 1842 – Mormonism in All Ages, J.B Tanner, also failed to mention or criticize Smith’s vision. 1853 – Lucy Smith, Joseph’s mother, published Biographical Sketches of Joseph Smith. This is where we first learn of Joseph Smith’s heroic childhood leg operation, Joseph Senior’s 7 visions and 2 of her own. There was no mention of any first vision. This absence is troubling when contrasted against Lucy’s lengthy stories about the angel and the plates. Recognizing the omission, Orson Pratt later placed the canonized vision story into her book word for word. 1854 – A Voice of Warning, Parley P. Pratt, 4th edition, contained no mention of the First Vision. “The angel again forbade Joseph to join any of these churches, and he promised that the true and everlasting Gospel should be revealed to him at some future time. Joseph continues: ‘Many other things did he (the angel) say unto me which I cannot write at this time’ “. Note: The Church altered the first reference of the angel to “the Holy Being”; the second reference was changed to “the Christ”. See Nature of God section for related evidence of Godhead confusion and lack of first vision history. Joseph Fielding Smith, Doctrines of Salvation 1: 188. Gordon B. Hinckley, The Marvelous Foundation of Our Faith, October 2002. Gregory Prince, Leonard Arrington and The Writing of Mormon History, 80. James B. Allen, “The Significance of Joseph Smith’s ‘First Vision’ in Mormon Thought,” 29–45. William B. Smith, William Smith on Mormonism, 8–10. Wesley P. Walters and Richard L. Bushman, “The Question of the Palmyra Revival,” 61. D. Michael Quinn, Early Mormonism and the Magic World View, 141. Elias Smith, The Life, Conversion, Preaching, Travels, and Sufferings of Elias Smith, 58–59. The Complete Works of Charles G. Finney. Solomon Chamberlain, Autobiography of Solomon Chamberlain. John Samuel Thompson, The Christian Guide to a Right Understanding of Sacred Scriptures, 71. Kurt Widmer, Mormonism and the Nature of God: A Theological Evolution, 1830-1915, 6. The Early Accounts of Joseph Smith’s First Vision, Dean C. Jesse, BYU Studies, 9:284. Smith, William Smith On Mormonism, 5. Joseph Smith, Personal Writings of Joseph Smith, edited by Dean C. Jessee, 84. Andrew Jensen, The Historical Record, Vol. 7, Jan, 1888. Journal of Discourses, Vol. 2: 171. Journal of Discourses, Vol. 18: 239. Journal of Discourses, Vol. 2: 196. Journal of Discourses, Vol. 13, 324. Journal of Discourses, Vol. 6: 335. Journal of Discourses, Vol. 6: 29. Journal of Discourses, Vol. 12: 334. Journal of Discourses, Vol. 13: 78. Journal of Discourses, Vol. 10: 127. Journal of Discourses, Vol. 20: 158–71. Journal of Discourses, Vol. 24: 135.